The DonJoy Stabilizing Speed Pro Ankle Support Brace is designed to meet the needs of demanding athletes everywhere. This ankle support brace features 800D ballistic nylon and a reinforced eyelet area for outstanding performance and durability. The speed element involves the innovative lace-up design which is quickly secured using Velcro, and is accompanied by figure-8 strapping. This locks the calcaneus (heel bone) into place and controls inversion/eversion. 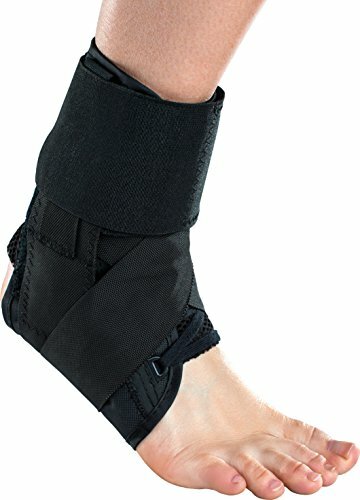 A full circumferential elastic strap secures the strapping and provides added tibia/fibula compression. Removable, articulated medial/lateral stays enhance proprioception (body position awareness) and stability. The lightweight, low-profile design allows the ankle support brace to easily fit inside your shoe. Universal fit allows the DonJoy Stabilizing Speed Pro Ankle Support Brace to be worn on either the left or right foot.